Chocolate and maple syrup go great together. I remember growing up, my dad would always pour maple syrup over his chocolate cake. 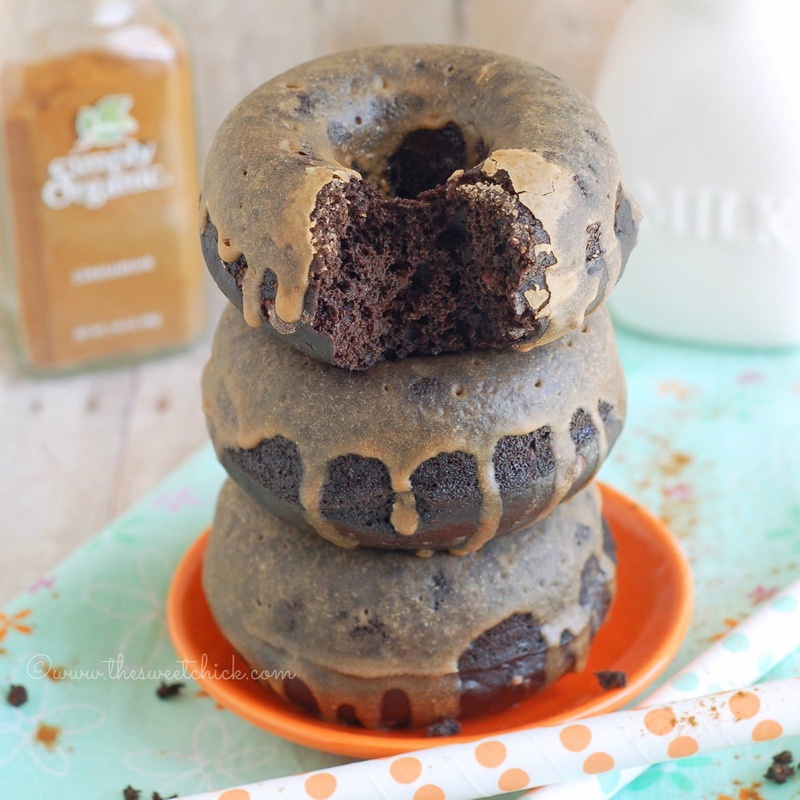 So why not bake it into some chocolate donuts, I say. My husband bought me these new pans last month for my birthday. Now I can make larger donuts. However, those are a lot more dangerous to have around the house. At least the mini donuts don't make you feel as guilty for eating them. I used my favorite Hershey's Special Dark Cocoa to make it a more decadent chocolate treat. You can go ahead and lick the spoon at this point. You know you want to. I did make one mistake by filling these pans all the way to the top. That resulted in my donuts coming out a little extra puffy. But never fear, I am not going to waste perfectly good donuts. I just flipped them over and cut out the holes with a small paring knife. And for the love of donuts, don't throw out those middles, just feed them to the kitchen trolls (kids or animals) that have been hovering around waiting for you to finish up and give them a donut already. You can leave the donuts plain if you want. They are rich in chocolate and maple flavor. Yes, they are cake-like as the original recipe stated. I wanted to add a little more cinnamon flavor so I added some in the glaze. You can also make a thicker glaze if you like by adding one less tablespoon of milk. I am going to go finish stuffing my face now. I think these are my favorite chocolate donuts so far. Using a hand mixer or stand mixer, mix together the flours, cocoa, sugar, baking soda, baking powder, salt and cinnamon until well combined. Add the eggs, milk, maple syrup and yogurt. Mix on low until mixture is smooth and well blended. Then add chocolate chips and mix until all incorporated. Use a piping bag or a Ziplock bag with tip cut off, to fill each donut reservoir to about 3/4 of the way full. Bake at 350ºF for 12-15 minutes until toothpick inserted in the donut comes out clean. In a small bowl whisk together powdered sugar, milk, vegetable shortening, maple essence and cinnamon until smooth. Dip the tops of each donut in the mixture ,then place back on the cooling rack until the glaze is dry. Then grab a glass of milk or a cup of coffee and dunk you donut! Enjoy! Recipe adapted from King Arthur Flour Chocolate Fudge Cake Doughnuts. We record this recipe,of course!! Those are crazy awesome looking!!! I heart homemade chocolate donuts! And a maple glaze? I think I am in love!!! 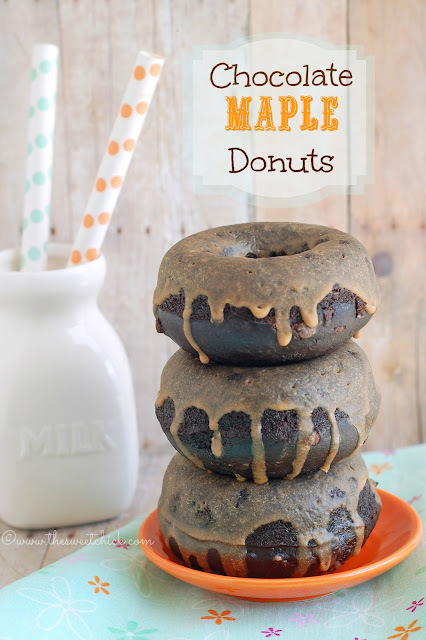 This is a very easy, delicious homemade chocolate donut recipe I want to have this evening. 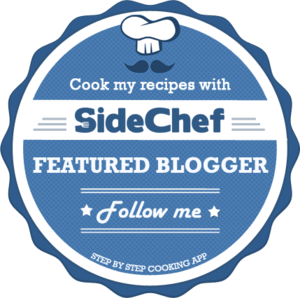 I love your recipes, Sweet Chick.